Our Spring Live Auction of Important Canadian Art includes a number of portraits by artists from a wide array of backgrounds. In certain works, importance is placed on the sitter’s identity, while in others the model is secondary to a particular sentiment or underlying message. Media and formal qualities such as colour scheme and brushstroke application also play a role in the artist’s intentions for presenting a human figure in a work of art. The longstanding practice of portraiture was historically intended for documenting and memorializing the rich and powerful. Prior to the invention of photography, a painted, sculpted, or drawn portrait was the only way to record one’s appearance. Customarily, most completed works consisted of a serious, closed-lip stare, rarely demonstrating any emotion beyond a slight smile. In most cases the artist’s objective was to capture the inner essence of the subject – the expression of character and moral quality, as opposed to anything superficial or temporary. Following the invention of photography and developments in modern art, portraiture has evolved as a practice to be much more liberated for personal expression and experimentation. The artists whose portraits are featured in our Spring Live Auction had the freedom to portray their subjects in their own individual style and for whichever purpose they chose. This blog entry takes a closer look at what makes a selection of six of these artworks significant and what differentiates them from one another, as I believe portraits can be better and further appreciated when a context is provided. Goodridge Roberts (1904-1974) was known for landscapes, portraits and still lifes with vivid colours and expressive brushstrokes. The identity of the sitter is particularly pertinent in this example of the Roberts’ work, as she is the artist’s wife. Painted in 1955, the artwork was acquired by the current owner directly from Mrs. Roberts in 1977. Joan’s relaxed pose, together with the casual interior setting with loosely draped fabric, alludes to a strong sense of intimacy in the picture; this is reinforced by our knowledge of the relationship between the sitter and the artist. Dame au collier de perles illustrates Jean Paul Lemieux’s ability to highlight human emotion and facial expression. Arguably the most famous Quebecois artist, Lemieux’s (1904-1990) portraits were often influenced by Edvard Munch and the Expressionist school of painting, as they evoke anxiety and the artist’s dark and tragic vision. The unidentified sitter’s powerful stare directly at the viewer exudes anxiousness and vulnerability; it is contrasted, however, with an ornate three-strand pearl necklace and glamorous red dress. A woman wearing a necklace became a recurring motif in Lemieux’s portraits, referencing the popular theme of feminine vanity in Western painting. Contemporary artist Evan Penny (b. 1952) worked with FX Smith in Toronto in the 1990s, making prosthetics, body doubles and other props for a variety of films. This experience inspired his later three-dimensional works, notably this relief sculpture from the L. Faux series from 2000-2005. The production plaster explores the notion of blurring boundaries between the real and the replica in its extraordinary detail that creates a lifelike three-dimensional portrait of Libby Faux. Executed in high relief, the sculptural aesthetic of L. Faux reminds us of the white marble portrait busts of Ancient Rome. Portrait of Thomas Archer, Esq. A Montreal native who studied in Paris, Randolph Hewton (1888-1960) was a pioneer of Modernism in Canadian painting of the early twentieth century. Portrait of Thomas Archer, Esq. was likely a commissioned work and demonstrates Hewton’s modernist take on the traditional practice of portraiture. The sitter’s attire suggests a formal or professional demeanor, though his cross-legged pose with a book on his lap and cigarette in his hand indicates a more casual or ‘modern’ tone to the painting. 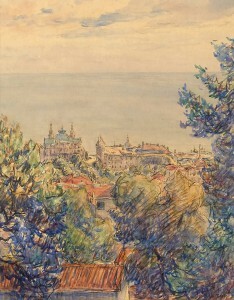 Hewton’s use of vibrant colours were at first controversial in Canada, as he had adopted this palette from the European Avant-Garde while in Paris from 1908 to 1913. Marc-Aurèle Suzor-Coté (1869-1937) was a famous French-Canadian artist known for his landscape paintings as well as portraits of their rural inhabitants. The artist had a deep respect and empathy for his sitters, as emphasized in this portrait of a peasant woman in profile. Suzor-Coté was influenced by 19th century French Realist artists such as Jean-François Millet. The Realists had the controversial objective to place importance on the working-class and elevate their status as worthy subjects for portraiture – which had traditionally been reserved for the wealthy. With 262 lots in our March Online Auction of Canadian and International Art, we see artwork for sale with a very large range in value. Although the covetable A.J. Casson and Albert Henry Robinson oil paintings garner much attention from seasoned collectors, it is worth noting the remarkable value and quality of the many more modestly priced artworks for sale. While estimates range from $50 to $15,000, there can be a tendency to believe that only the high-profile items are relevant and worthy of attention within the art market. There is also a misconception that art auctions do not offer anything affordable to begin with. The reality is that art of good quality and value can be found at any price, and an art auction can be the ideal place to find it. If you have an interest in starting an art collection, an auction is a perfect place to do so and should not be intimidating. The quality and value of the lower estimated artworks can be far superior to something of the same price at a commercial gallery or retail store. I have compiled a selection of nine noteworthy artworks from our March online auction, in a variety of styles and mediums, each of which are estimated to sell for below $1000. As a young professional in the art world, I would like to demonstrate that it can be accessible to all, regardless of one’s budget. The concept of building an art collection does not have to be so far out of reach. A few things to keep in mind: The estimate is our prediction of the selling price based on previous sales of similar works at auction – however, it is possible for the work to sell for below or above the estimate. Also note that a buyer’s premium of 15% and applicable taxes are added to the final selling price of an artwork. All of the following artworks are framed, avoiding any extra costs and making it easy to instantly hang up on a wall. For the Toronto native or admirer of architectural history, this original oil painting illustrates a very early view of Toronto’s skyline – dating to 1928. The semi-abstract composition in mint green and lavender provides a rare depiction of Toronto from a past time. For the year 1950, the artwork has a very contemporary aesthetic to it, in the quasi-abstract lanterns and moody colour scheme. A Montreal native, Caiserman-Roth studied at the Parsons School of Design and Art Student League in New York, as well as the Musee des Beaux Arts in Montreal. Casson was a prominent member of the renowned group of Seven, the most internationally recognized association of Canadian artists. While his oil Sombre Day, Lake of Bays is the highest valued artwork in the March auction, the prolific artist produced numerous prints which sell for a more modest price. The brightly coloured flowers of this linocut has a fresh, modern palette and Pop Art quality to it. 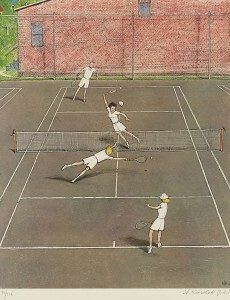 For the sports fan, Kurelek’s lithograph is a playful, whimsical rendition of a mixed-doubles tennis match. A very popular artist whose original works sell for high prices, Kurelek’s prints are still very much in demand, though at a much more affordable price range. A self-taught painter, printmaker, and illustrator, Morrisseau’s colourful images depicting First Nations subjects were initially criticized in the Native community for its disclosure of traditional spiritual knowledge. Morrisseau came to develop a very strong reputation, completing many commissions including the Indians of Canada Pavilion at Expo 67. This large serigraph offers a very colourful addition to a room, along with carrying cultural significance. A contemporary Toronto photographer, Hinton has exhibited internationally and her work is found in numerous collections around the world. The artist is particularly fascinated by bridges, with Brooklyn Bridge Double (1994-99) being an example. Hinton’s work is currently for sale at an art gallery at much higher prices. 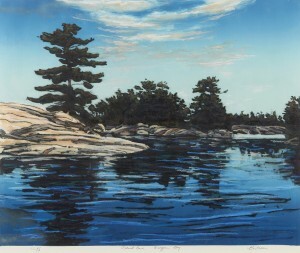 Ed Bartram provides a very contemporary take on the Group of Seven’s favourite subject: Georgian Bay. The large size, brand-new frame and jewel-toned blues make this etching an eye-catching addition to any room and art collection. Armington is a Canadian born and raised artist, although the majority of his work depicts European scenery. Based in Paris from 1905 to 1939, the artist portrayed French urban and rural landscapes in a variety of mediums, including etchings, lithographs and watercolours. This adorable woodblock print seems to speak for itself. 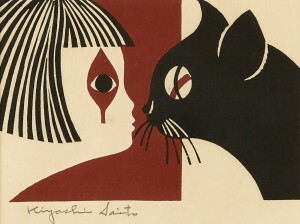 Saito was one of the first Japanese printmakers to have won at the Sao Paulo Biennale in 1951. Posted November 22, 2016 by Rob Cowley & filed under Consignor Updates, Sale Updates. A 1912 oil sketch by Group of Seven member J.E.H. MacDonald sold for $230,000 at auction on Tuesday night, including a 15 per cent buyer’s premium. Tracks and Traffic was among several notable works up for sale at Consignor Canadian Fine Art’s fall auction. It had a pre-sale estimated value of between $200,000 and $250,000 not including the buyer’s premium. Tracks and Traffic provides a glimpse of what Toronto looked like more than a century ago, depicting a scene from the Harbourfront neighbourhood during the industrial period. MacDonald and Lawren Harris were close friends and the pair often painted together in Toronto. Tracks and Traffic was created months after the two artists met in late 1911 and eight years before the Group of Seven was formed. Harris sketched the scene from another angle, suggesting that the two artists could have been together during the painting expedition. MacDonald’s subsequent oil canvas based on the sketch was included in the Toronto stop of the Steve Martin-curated exhibit The Idea of North: The Paintings of Lawren Harris, which was presented at the Art Gallery of Ontario earlier this year as well as the Hammer Museum in Los Angeles and the Boston Museum of Fine Arts. Other items up for sale included works from the Group of Seven, Jock MacDonald and William Kurelek. An important canvas by Painters Eleven founding member Jock MacDonald, Daybreak from his Modality series, sold for $69,000. An oil on panel by Group of Seven member Franklin Carmichael, owned by a descendent of the artist, Bracken, Lansing sold for $69,000. A work by William Kurelek, Candy Floss Clouds, sold for $34,500. A charming 1907 painting of a mother and child by J.E.H. MacDonald titled A Hill Path, High Park sold for $27,600. The painting is believed to have been a gift from MacDonald to Albert H. Robson, a Canadian art author, historian and former vice-president of the Art Gallery of Toronto (now the AGO) more than a century ago. (Toronto – November 7, 2016) – Following Consignor Canadian Fine Art’s highly successful live auction debut in May 2016 (that included a record-breaking sale of Lawren Harris’s Algoma Sketch 48), the auction house launches its second live auction event featuring an exciting catalogue of important Canadian works, to be held at the historic Berkeley Church in downtown Toronto on November 22, 2016. A 1912 sketch by founding Group of Seven member and one of Canada’s most celebrated painters, J.E.H. MacDonald, Tracks and Traffic (auction estimate: $200,000 to $250,000), will anchor the auction. Tracks and Traffic is a sketch of the well-known canvas that is currently part of the Art Gallery of Ontario’s (AGO) collection, and was recently included in the Toronto showing of the Steve Martin-curated exhibition, The Idea of North: The Paintings of Lawren Harris. The work provides a glimpse of what the city of Toronto looked like over a century ago, and depicts a scene of the harbourfront neighbourhood at the intersection of Bathurst Street and Front Street during the industrial period. It is well known that MacDonald was one of Lawren Harris’s closest friends and the pair often painted together in Toronto. Tracks and Traffic was created just months after the two artists met in late 1911, and eight years before the formation of the Group of Seven. Harris also sketched this scene from another angle, suggesting that the friends could have been together during the painting expedition. If so, the sketch would mark one of the very first examples of members of the Group of Seven painting together. DEBUT – A charming 1907 painting of a mother and child by J.E.H. MacDonald titled A Hill Path, High Park (auction estimate: $20,000 to $30,000). 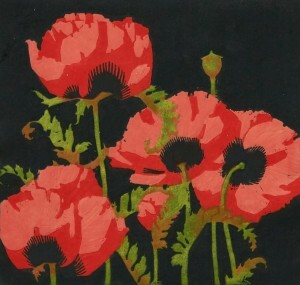 The painting is believed to have been a gift from MacDonald to Albert H. Robson, a Canadian art author, historian and former VP of the Art Gallery of Toronto (now the AGO) more than a century ago. The painting, owned by the family of Albert H. Robson, is offered for sale for the first time. To preview the full catalogue online, go to www.consignor.ca. Live previews will take place until November 21 at the Consignor Canadian Fine Art Gallery located at 326 Dundas Street West. Consignor’s Fall Auction of Important Canadian Art will be held on Tuesday, November 22, 7:00 pm at the Berkeley Church, located at 315 Queen St. E. in Toronto, ON. 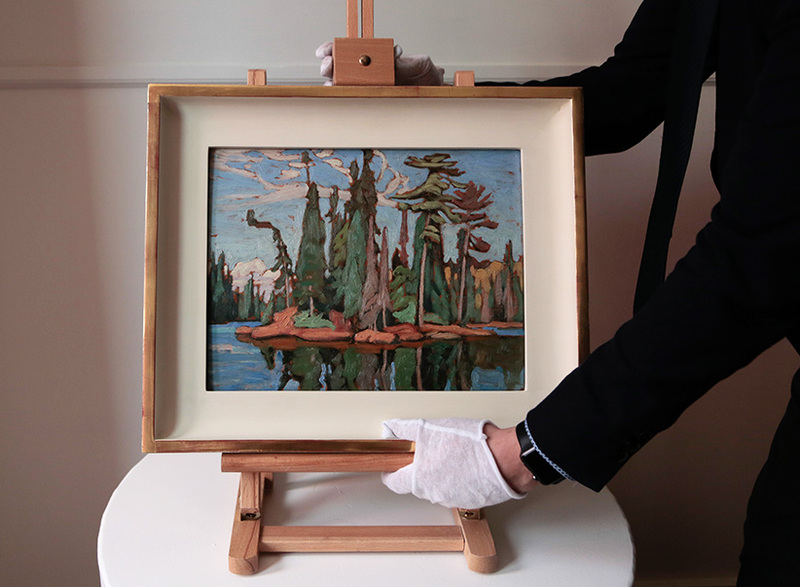 Since its inception in 2013, Consignor’s auctions have included headline-grabbing and record-breaking works including Algoma Sketch 48, a rare Lawren Harris preparatory oil sketch that debuted on the auction block at Consignor’s inaugural live auction event in May 2016 and set the record for the highest-selling Algoma sketch ($977,500) by the artist at auction. Other highlights include a 100-year-old Tom Thomson portrait (Daydreaming, sold for $172,500) and an undiscovered William Kurelek (Ukrainian Proverb, sold for $41,400, well above its estimated value). Consignor’s offering of Jack Bush’s Summer Lake broke online auction records in May 2014 for the most expensive painting by a Canadian artist to be sold at an online auction ($310,500), and its June 2014 auction saw eight artists’ records broken. Consignor is also holding an online December Auction of Artwork, from December 7-14, 2016. Consignor offers all-inclusive selling commissions and the lowest Buyer’s Premium in the industry. Those interested in consignment can arrange a complimentary and confidential consultation by contacting Consignor’s specialists at 1-866-931-8415 or [email protected]. 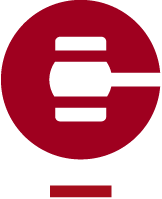 Consignor is currently accepting artwork for inclusion in its Spring 2017 auctions. Consignor Canadian Fine Art is a partnership between art auction veterans Rob Cowley, Lydia Abbott and Ryan Mayberry (Partner at Mayberry Fine Art and Founder of Consignor.ca). Cowley and Abbott became principals in the venture with Ryan Mayberry, taking Consignor.ca from its original form, as a branch of Mayberry Fine Art, to a separate company focusing on auctions of Canadian art. Posted September 14, 2016 by Rob Cowley & filed under Consignor Canadian Fine Art News & Press, Consignor Updates. Last December, Rob Cowley, the president of the Toronto-based auction house Consignor Canadian Fine Art and Appraisers, got an email from an Australian collector inquiring about a piece of art. When he opened the attached photograph, he knew he was looking at something extraordinary. Even though the image was low-res and fuzzy, he instantly recognized it as a version of Island-MacCallum Lake by Lawren Harris, a painting so emblematic of the country’s most important art movement, it was the cover of the National Gallery of Canada’s 1995 book, The Group of Seven: Art for a Nation, written in celebration of the famous painters’ 75th anniversary. First exhibited in 1921, Island-MacCallum Lake (which now belongs to the Vancouver Art Gallery) is a fall scene of a tree-covered island resting in serene Algoma waters. Long known as one of Harris’s most important works, its subject is one the artist returned to repeatedly; he made at least four known variations of the painting—one of which sold in 2008 for just over a million, reputedly to the actor and comedian Steve Martin. From a picture of the back of the painting, Cowley also knew there was no question about its authenticity. It showed a rare label from the Mellors-Laing Galleries, once located at 759 Yonge St. in Toronto. “Because the gallery was in existence for only one year—1940,” says Cowley, “we could date the work’s sale.” The painting’s verso showed the number 48, which corresponded to an inventory of Harris’s art created in 1936. Talented, well-educated and wealthy (he was heir to the fortune of farm-machinery manufacturer Massey-Harris Co. Ltd) Lawren Harris was the perfect patrician voice to lead the early 20th-century charge for Canadian art. After attending the University of Toronto, he spent four years in Berlin from 1904 to 1908, where he found himself observing a culture whose art schools were being shaken by new approaches toward painting. Impressionism, expressionism, and abstraction were teachings that he brought home and shared with friends, including Tom Thomson and J.E.H. MacDonald. He became the unofficial leader of the Group of Seven, which held its first exhibition in May 1920. Algoma, the northwestern Ontario region beyond Lake Superior, where Harris found his subject for Island-MacCallum Lake, became a critical geographic inspiration for the group. Harris first visited the territory in May 1918. Mesmerized by its expansive vistas of trees and winding rivers where no clearings could be spotted for miles, he returned to the uncharted territory repeatedly and with fellow Group of Seven members MacDonald, Frank Johnston and A.Y. Jackson. They travelled in a railway boxcar that Harris had refurbished with a sink and a stove so that it could be used for transport and as a living quarter. Few of the lakes in Algoma could be found on a map, so the group named the bright waters they painted after people they admired. 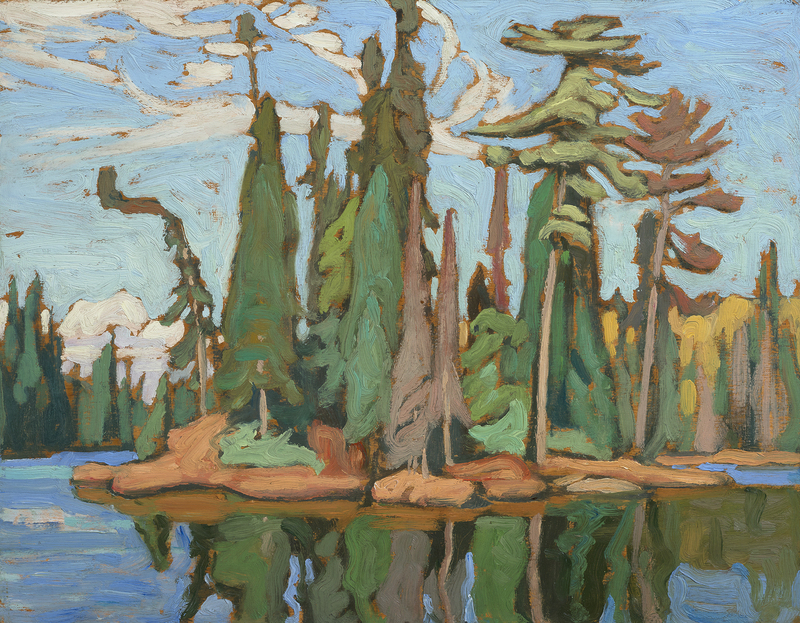 Harris titled the scene in Island-MacCallum Lake in homage to Dr. James MacCallum, the renowned patron of Tom Thomson. What Harris most certainly would never have imagined is how six decades later his study for that work, now known as Algoma (Algoma Sketch 48), would find its way to Australia. 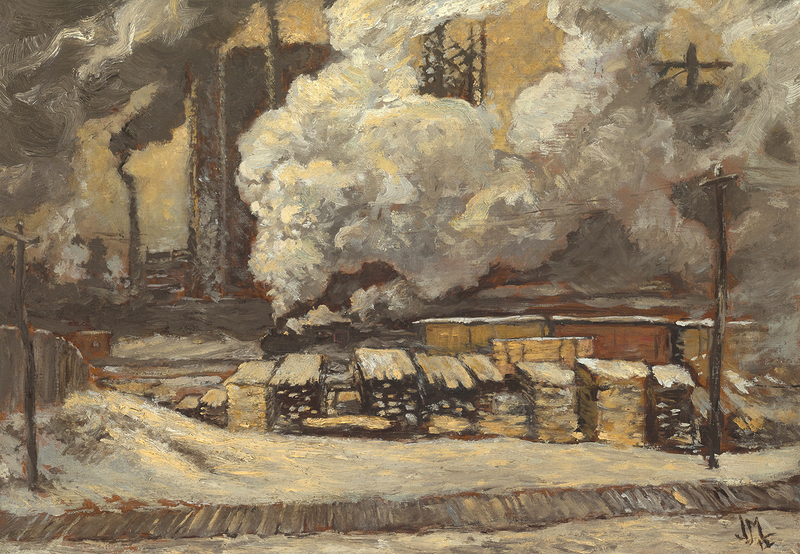 In 1940, a Toronto businessman purchased the painting at the Mellors-Laing Galleries. He and his wife placed it on the wall of their family room, where bedtime stories were read to their young daughter. In the 1960s, that daughter moved with her husband to Canberra, but Algoma (Algoma Sketch 48) always remained in her mind. Knowing this, her parents willed her the work, and in the 1980s it became part of her South Pacific home. The painting “always reminded me of comfortable family times and camp days in northern Ontario,” she told Maclean’s, requesting to remain anonymous. Meanwhile, the market has paid unprecedented amounts for his art. Last November, his sales record was broken when the auction house Heffel sold Mountain and Glacier(1930) for $4.6 million, more than triple its presale high estimate of $1.5 million. That hasn’t gone unnoticed by those who own works by Harris. 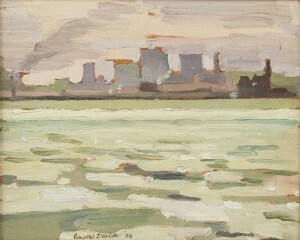 Heffel, as well as Canadian auction house Waddington’s, have Harris paintings in their spring sales. “Arguably there could never be a better time than now to sell works by Harris,” said David Silcox, art historian and former director of Sotheby’s Canada. Still, she had a final reservation before letting Algoma (Algoma Sketch 48) out of her home: How would it be sent to Canada? The painting, which was under glass, could not be transported in this format, but removing its frame was a challenge for anyone but an expert. Cowley offered a suggestion: “What if I came to your house to pick up the painting?” That persuaded her to consign the work. For the next 25 hours Cowley transported Algoma (Algoma Sketch 48) further than any other work by Lawren Harris has ever travelled. The painting, which he carried in a specially insulated, custom-built brief case, was never out of his grasp. (Toronto – March 31, 2016) – An exceptional Lawren Harris oil sketch that was recently discovered in a private collection half way across the globe in Australia, will debut on the auction block nearly 80 years since it was first acquired from a Toronto gallery in 1940. Algoma (Algoma Sketch 48), an autumn oil sketch painted by Harris in 1919/1920, during the time when the Group of Seven officially formed as an association of painters, is expected to fetch $400,000 to $600,000 at Consignor Canadian Fine Art’s inaugural Live Auction of Important Canadian Art, taking place at the historic Berkeley Church, in downtown Toronto on May 31, 2016. In addition to its pristine condition, the value and rarity of this particular Harris sketch stems from the fact that it served as the preparatory work for several of the artist’s well-known large canvases including Island, MacCallum Lake (1921) part of the collection of the Vancouver Art Gallery; as well as for three others: Northern Island, Northern Painting XXV, 1924; Northern Painting 25, Northern Island II; and Island, Northern Painting XXI, which are all believed to currently reside in private collections. Harris first visited the Algoma region of Ontario in 1918 and returned on multiple occasions with fellow members of the Group of Seven. Algoma Sketch 48 was acquired by an anonymous buyer in 1940 from the historic Laing Mellors Gallery in Toronto, later travelling with the family when they moved overseas. Lawren Harris is one of Canada’s most celebrated artists, and his works are currently at the height of popularity with the much-lauded retrospective The Idea of North: The Paintings of Lawren Harris, co-curated by actor, comedian and art-collector Steve Martin, anticipated to make its Canadian premiere at the Art Gallery of Ontario in July 2016. Several weeks of live previews will begin during the first week of May at the Consignor Canadian Fine Art Gallery located at 326 Dundas Street W. Consignor’s inaugural live Spring Auction of Important Canadian Art event will take place on Tuesday, May 31, 7:00 pm at the Berkeley Church, located at 315 Queen St. E in Toronto, ON. The live auction event begins a new tradition for Consignor, augmenting its current slate of notable online auctions established over the past three years through Consignor.ca. Since its inception in 2013, Consignor’s auctions have included headline-grabbing works such as a rare 100-year-old Tom Thomson portrait (Daydreaming, sold for $172,500) and an undiscovered William Kurelek (Ukrainian Proverb, sold for $41,400). Consignor’s offering of Jack Bush’s Summer Lake broke online auction records in May 2014 for the most expensive painting by a Canadian artist to be sold at an online auction ($310,500), and its June 2014 auction saw eight artists’ records broken. Consignor is also viewing artwork for consideration for the upcoming Online Auction of Canadian Art, acting as the second session to the live sale, with bidding open at Consignor.ca between June 1 – 8, 2016.